This Made in the USA magnetic keychain ring has strong powers of attraction. It can carry up to four pounds, organize nuts and bolts, track paper clips, find studs, or hang your keys. 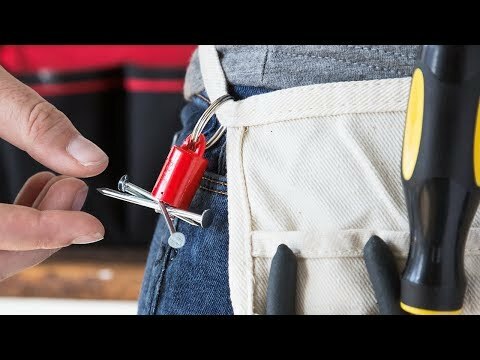 Whether you’re using it to hide spare keys or give your tool belt a magnetic pocket, it’s a small addition that is endlessly helpful. Strong and durable, holds up to 12 lbs. 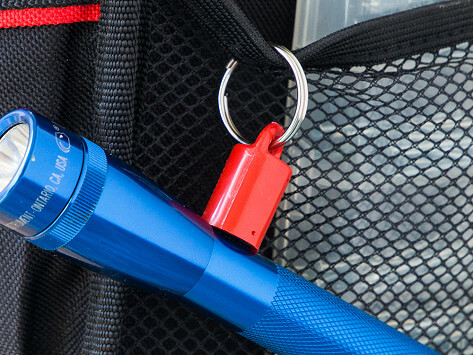 Dimensions: 0.63" diameter x 1.13"
Handy for carrying light-weight items and easy to use. Great for gifts. Ooops! We both have pacemakers. Gave it to son to take away. He likes it. Smaller than a quarter, but strong enough to carry four pounds, this little magnetic keychain can perform herculean feats for its size. MagnetPAL is Made in the USA from neodymium rare earth metals, then compacted and coated with rust-proof plastic. It can organize nuts and bolts, track paper clips, find studs, and help you hang, corral, or hide your keys. Instead of slipping a spare set of keys under the mat, now you can try all sorts of new magnetic hiding spots—like under the gutter. And if you need a handy helper, MagnetPAL can attach to your hand tools to hold bits, or give your tool belt a magnetic pocket. It’s a small addition that does a lot of heavy and helpful lifting.